NBA All Star Weekend is finally here, which for some of you means TNT will be off for the next 72 hours just because you MIGHT accidentally catch some of the action (Dad?). For the rest of us hardwood classic lovers, the best of the best will fill snowy Dallas and compete for three days before returning to the regular season. Six events will be played during the weekend, and before you think that no one really cares who wins, remember that there are money incentives for each player competing. For instance, the winner of the Taco Bell Skills Challenge will walk away with $35,000, while the fourth place finisher only takes home $9,000. While the money is mostly chunk change to most of the competitors, we can expect to see the best from everyone because the rest of the league will be watching. Why: The sophomores (second year players) have defeated the rookies seven times in a row and even though the rookie class is talented, the sophomores will be too much to handle in this one. It has become a kind of initiation for the sophomore, a year after they get beaten as rookies, return the favor to the newcomers. Brook Lopez, Kevin Love, O.J. Mayo, and Russell Westbrook headline the sophomore squad, who will be playing without Derrick Rose (all star/injury), while the rookies counter with Tyreke Evans, Brandon Jennings, Dejuan Blair, and Stephen Curry. Why: I’d be lying if I tried to break the competition down, but my real reasoning is that team Texas has the best NBA participant in Nowitzki as well as one of my favorite TV personalities in Kenny Smith. Team Sacramento will be interesting because Tyreke Evans is sure to try his hardest while Chris Webber still has a little shot left in him. Why: Outside of the Slam Dunk Competition, this is easily my second favorite part of All Star weekend. Being a guard myself, it’s always fun to watch the game’s fastest back court players weave in and out of drills, pass with perfection, and race to the finish line. With Rose trying to heal his injured hip, Nash seems most fit to re-claim his 2005 title. Deron Williams won the competition in 2008 while Brandon Jennings is the fastest of the four. Jennings’ Achilles heel will be the mid-range jump shot during the middle of the challenge. In the end, Nash will win it with his crisp passing and great shooting touch. Why: I have watched more than my fair share (too many) of Knicks games this season, and I have to say Gallinari impresses me every time out. He has gone from “just another Knick bust” to potentially the next Dirk Nowitzki (OK, he has a long way to go before that). But still, he has the most three-pointers made this season and, while his average is down, he is very streaky. Stephen Curry is known for his streaks as well, while Cook is the defending champ. Billups and Pierce are really going to struggle because of the stamina needed, and I have zero faith in Frye (which means he’ll probably win). Why: This might be the most sure bet I have all night when I say Shannon Brown is going to destroy the competition. People are tired of seeing Nate Robinson, who competes seemingly every year, and Gerald Wallace has never been too flashy. The one person who will give Brown problems is DeRozan, who is long and “jump-out-of-the-gym” athletic. 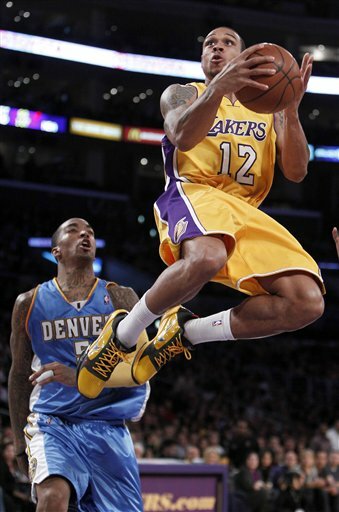 Still, Brown can absolutely fly and you have to think his Laker teammates were giving him great ideas. For the record, LeBron James should be in the competition and if he was, he would win with ease. Why: The key loss for the West is easily Kobe Bryant, who seems to thrive in this game (which really means he gets the most open layups and dunks). But outside of Bryant, the West is also missing guards Chris Paul and Brandon Roy, who were replaced by Chauncey Billups and Jason Kidd. On the East side, expect this one to be the LeBron-Wade show, as LeBron James and Dwyane Wade are sure to put on a show for the crowd with dazzling dunks and long-range missles from downtown. As a whole, it just seems like the East has more firepower and better personalities who will put on a show. That will also result in a win for the East. The two conferences have traded wins and losses every year for the last four years, with the West coming out on top last year in Phoenix.